Chain-mail for babies; clothes for dogs; land rights for gay whales; church services for broken crockery; enforced circumcision for unmarried laundry baskets; Venezualan pasta balancers; high-altitude goat-fondling; self-service appendectomy bars; Liberace's merkin. I don't know what to think of any and all of the aforementioned – I blame the gaps in the educational system, the addition of formaldehyde into the public drinking water system by successive Labour governments and the mental trauma induced by my woodwork teacher's inability to pronounce the word "hydro-elastic" without making it sound like "My navel is full of Germans". 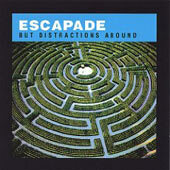 In a similarly puzzled vein, I give you, gentle reader (give...not charge for or use as a bartering tool, you'll notice) my review for the But Distractions Abound by the rather enigmatic New York band Escapade. First up, I must say that I like this album; I'm a fan of the weird, an acolyte of the strange...so But Distractions Abound falls happily into my misshapen little world. The opener, Partial Memory Occurrence reminds me of the "Omm" grooves so ably laid down by those maestros of space-rock Gong and the hideously over-talented Steve Hillage. In fact, there's a drone-like quality threaded throughout the entire album, but this track gets into that whole "Is this Moroccan or Afghan?" vibe from the off. Escapade, on this evidence at least, could be yet another child of the "Canterbury scene", the small south-eastern English city which spawned such musical avant-garde behemoths as the aforementioned Gong and Hillage, Caravan, National Health, Henry Cow and the mighty, peerless Soft Machine. I'm driven to surmise that the whole of this album is improvised, rather than written, as the performances herein are so free and uncluttered by organised patterns. For instance, the second track, Coldth, has almost two minutes of weird, almost organic feedback/organ wailing at its start, before drums, bass and guitars leap in with the suddenness of an asteroid strike. Indeed, this could have been the accompanying music to the Tunguska Impact. I'm also put in mind of German band Can – I know very little of Can's work (although one of their number, Holger Czukay, collaborated on two wonderful ambient albums by David Sylvian), but the vibe here places me firmly in Can's front garden, if not exactly into their living room with my feet on the coffee table and my underpants in their usual "gaffer-taped-to-my-head" position as I watch their cable TV and consume the contents of their fridge. Track three, As Far As, takes the "Omm" idea even further, with its opening, Tibetan-esque synth chime, subjugated by a plucked instrument which sounds like a Himalayan peasant's stringed instrument. A simple kick-drum and sitar-like guitar (way, way back in the mix) all add to the strung-out Eastern feel here as the cut gains momentum, bass and drums eventually adding meat to the bones. The dénouement is something I'd expect to hear on a King Crimson or (again) Gong album and this track, the longest on the album at 13:24, is also easily the band's finest moment on the CD. Really quite splendid. Mistitled kicks off with some beautiful, spaced out guitar work laid over a gloriously hippy-heavy, menacingly slow bass and drums chassis. This dissolves into something akin to what I can only describe as cyber-jazz before settling back into a starship's nosedive through the upper atmosphere...and it's here that I think Escapade have me puzzled. Much as I love what they do on this album, the flashes like this which make me wonder what they'd be like if they applied just a little pre-determined order to their work. A pure construct (i.e. with little left to the band's individual members' improvisational skills) would destroy the very freedom which acts as the catalyst for the fantastic sounds they produce, but I'm left longing for the merest slice of order to give just a tad of cohesion and definition of direction. That said, I love this track – its eclecticism sparks neurons into life and ignites the flames under some intangible, personal musical memories. Wonderful. Memley Mem is the battle-music of a modern day Roman war galley, with its unrelenting beat and militaristic throb. I do find the one piece of vocal here (and even then , it's just a satisfied "aahhhh") quite disturbing. I must say, though, that this track, along with the following cut (and the album's closer) Adhere, feel like the world's longest song intros. And that, gentle reader, is my one gripe with this album. The improv on offer here is good and Escapade hit the mark more often than not, but I'm ultimately left feeling that there's unfinished business to be had. I hark back to my stated opinion that one or two tracks could benefit from a pre-arranged and (dare I say it?) pre-rehearsed intro, outro or central fulcrum upon which they could pivot. My erstwhile Sponge colleague and stoat-strangling champion PostLibyan tells me that Escapade's other albums are highly enjoyable and I'll therefore be seeking them out post-haste. As for But Distractions Abound, I can only recommend it to you if you embrace all that which is unearthly and unattached to form. Someone very wise once told me that music like this should not be listened to in the traditional sense; "just let it happen around you" was the advice. Sage words I feel compelled to pass on to you. Oh...yes...and the other thing about which I don't know what to think is the reported rise (and popularity) of the brothel. With the global economic squeeze, no-one's going to make any money selling broth, surely?